SUNDAY 23RD SEPTEMBER: CANOES FOR HIRE AT COED GWILYM PARK. First hire at 10.30. Last Hire at 2.30pm. Canoes £7, rafts £10.00, kayaks £5 and £4. Fulldetails on the website under Canoe Hire. Tuesday 25th September: Work Party Meets at Brownsters Cafe between 8.00 and 9,.00a. Work Starts at 9.15am on the canal south of the Mond Clydach Lock. The reeds have blocked the channel here and we must pull them out. 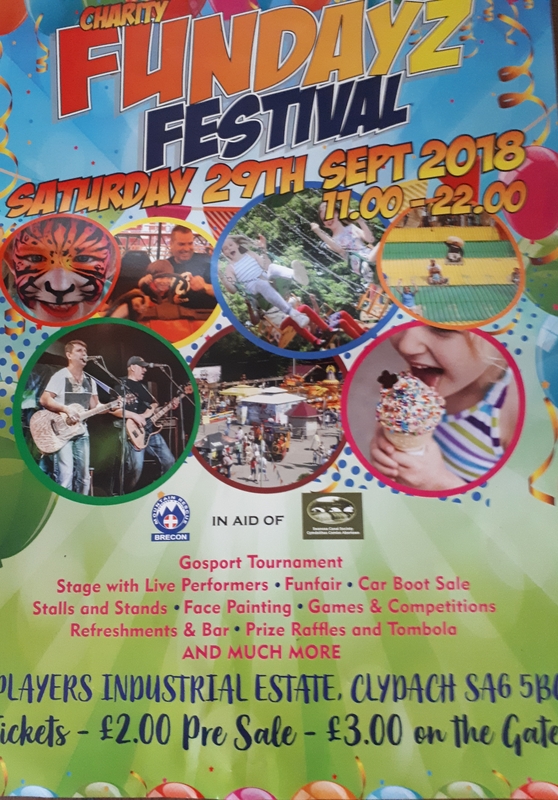 Saturday 29th September: Fundayz Festival at the Players Industrial Estate, Clydach from 11.0am to 10.00 pm . All profits shared between the Brecon Mountain Rescue and the Swansea Canal Society. 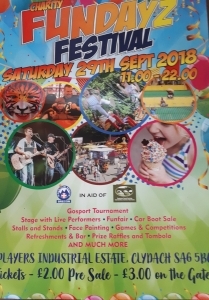 We are extremely grateful to Colin Twells, Manager of the Players Industrial Estate, for choosing us to be one of the beneficiaries of this wonderful event. Tickets £2.00 in advance , £3 on the day. For more details of the full programme see the Welcome Page on this website.